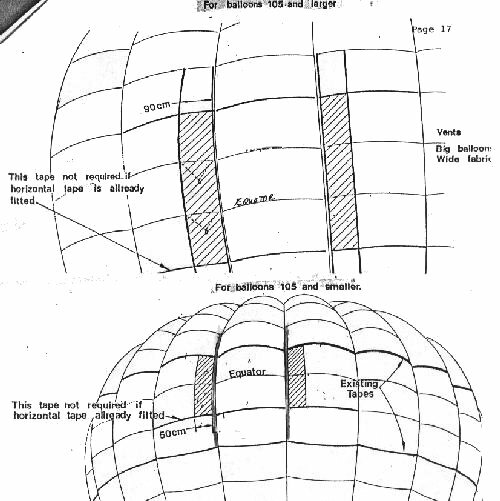 Materials and ideas listed here are in part unproven and may be hazardous to use in the construction and operation of experimental hot air balloons. Building and flying experimental aircraft involves significant risk and may lead to serious injury or death. Always obtain professional advice when building or flying human-carrying aircraft! The following directions have been used successfully. They were originally done by Miki Killingsworth from when she worked at Thunder & Colt, USA. Use at your own risk. There is no guarantee that these directions will work for you. The drawings here show the turning vents with one full gore between them. This is the recommended and normal way of doing this. However, there is nothing wrong with putting them further apart. The easy way to do this is to sew a set of three full gores together. Install the turning vents on them as shown, then add that set of 3 gores into the rest of the balloon. If you want them further apart. Sew 2 sets of 2 gores together, make one turning vent in each of these pairs, then sew them into the balloon as appropriate. The first thing you do is run a vertical load tape right next to the vertical load tape on your balloon (on the outside - toward your flap opening). On a horizontal cut balloon, this load tape goes up above your vent flap by one panel, and down below your vent flap by one panel. Cut the hole in between these two tapes. You should have a hole cut only where your flaps will sit, with vertical load tape running above and below this section by one panel. See pictures 4 & 5. Your vent flaps should be 90 centimeters (36 inches) wide. If your balloon is all one color in this area, you can cut the flap all in one piece. If you have different colors, add an extra 5 centimeters (2 inches) to the top of the top panel and the bottom of the bottom panel (or 10 centimeters (4 inches) to the entire panel if it's in one piece). See picture 3. If your flap is all one color and you are using 60 - 65" wide fabric. Save on waste by making the flap exactly 1/2 the width of your fabric, i.e. 30 - 32". Cut your flags. They should be around 35 centimeters (15 inches) per each triangular side on a balloon less than 77,000 cu ft. For larger balloons make them a little bigger. Run a lightweight ribbon all the way around them, making a tie-off loop on one corner. See pictures 1 & 6. Put sticky back or load tape on the outside of your seams where you're going to sew the flags to. Sew the flags on. See picture 1. Next are your flaps. Sew a load tape to the outside of your flaps (vertically), letting it pucker up a bit. You want the outer edge of this flap to be smaller than the panel it sits against - that's what keeps it closed. See picture 3. Now you're ready to install the flaps. 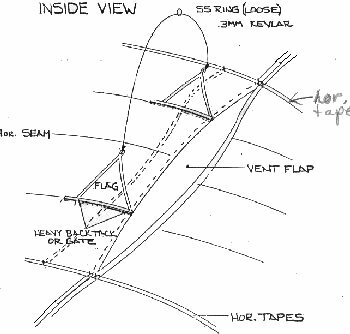 Sew the flaps to the original vertical load tapes. Then sew the horizontal seams. When you're finished, the vent flap should be around 10 centimeters (4 inches) tighter than the panel it is resting against. See picture 2. Now go back and run horizontal tapes over the top and bottom of the flaps, if they're not there already. Now gait EVERY SINGLE cross point and edge of your flaps! VIOLA! We have turning vents! Tie a short rope between the two flags and put a ring on it. See Picture #1. Attach your turning vent line to the ring. This allows for even pressure on the two flags. Run the vent line across the balloon so that it pulls the vent open. But you don't want the line to go across the center of the balloon, so run it about 1/3 away around the balloon. This keeps it out of the way of the flame. Put a pulley here, attached to the load tape. Note: This picture shows 3 flags per vent. It works better if you just use two. 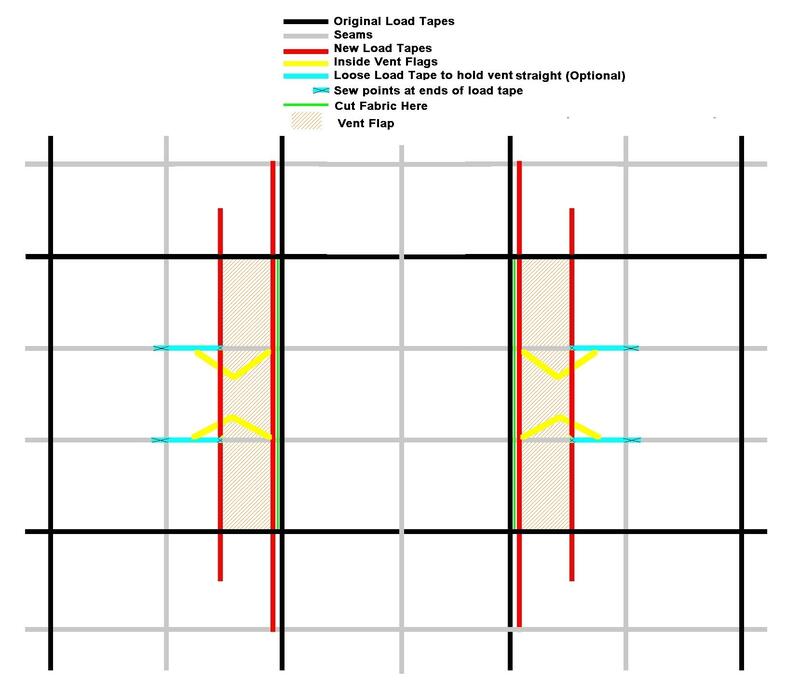 If you are making a 105 or bigger and the vent spans 3 horizontal panels, these flags go on the horizontal seams. If the vent only spans two panels, put them between 1/4 and 1/3 the way from the ends of the flap. 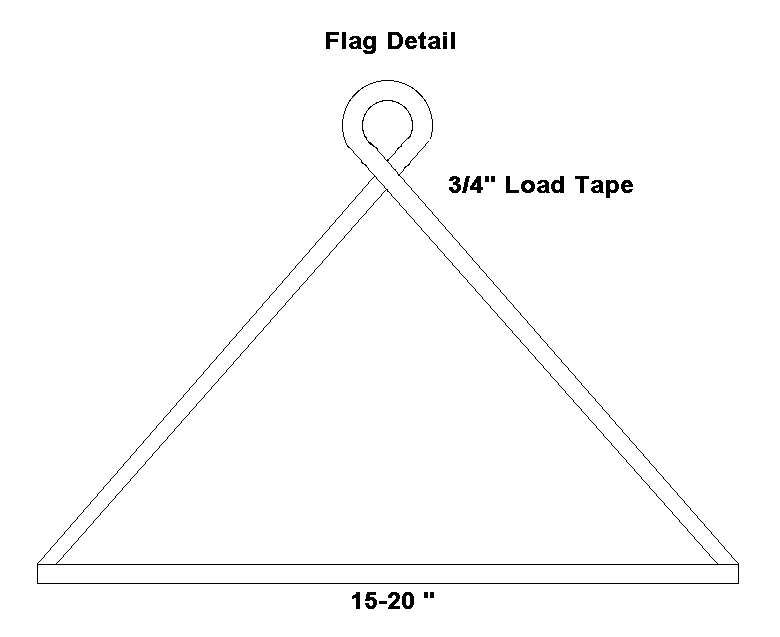 Attach a piece of 550 Parachute cord to both flags, with a 2" metal ring on the cord. The ring should be free to slide up and down the parachute cord. Fasten the vent line to the ring. This will make it so you have even tension on both flags The vent line then goes to a pulley about 1/3 around the balloon. Do not go straight across so that the vent line is not in the way of the flame. If your balloon does not have horizontal load tapes, put horizontal load tapes where shown. 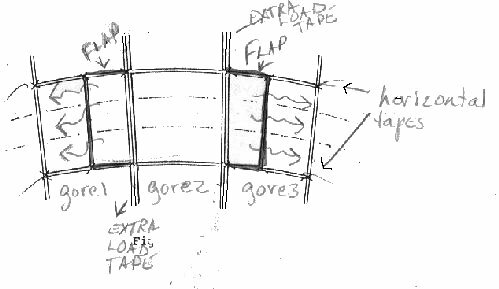 The vent flap is attached to the original vertical load tapes. The new load tape (in red) gets pulled in by the vent flags.